Why do you need Camping Key Europe? Campsites that are affiliated to Camping Key Europe are members of the trade organisation SCR Swedish Camping, which promotes sustainable campsite development in Sweden. The charge for the card funds quality assurance, and work on electrical and fire safety, environmental issues and other campsite development. In addition to the work to give you a quality-assured camping experience, the card offers a number of direct benefits to you as our guest. - Quick and easy check-in and check-out. No papers to fill in, just swipe or scan your card from the mobile and it’s done. - Accident and liability insurance. With the card, the whole family is insured in the event of an accident. - Discounts and offers in Sweden and abroad. - Discounts on accommodation at thousands of campsites in Europe. 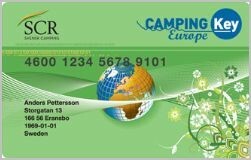 When you buy the card online you will receive a digital card to download in the app 'My Camping Key'. This card is valid for 12 months from the date of purchase. All cards sold online cost 150 SEK, while the cards sold at the campsites cost 160 SEK. Save time and money, buy your card here! In our restaurant you get 5% discount with the Camping Key Europe when you buy a hot meal.